We offer suitable high voltage lines assembled with SHV, MHV and BNC-HT connectors. Extend cables easily with our extension cables for SMA plugs to SMA jacks. is not simple to determine, because a lot of factors are decisive. 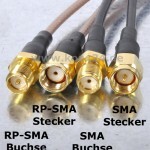 DIFFERENCE COAXIAL AND NORMAL LINE!